QiOVA designs and delivers innovative laser marking and micromachining solutions for the OEM industry. Founded in 2011, QiOVA has been pioneering the development of programmable laser beam shaping for high power and high energy applications. 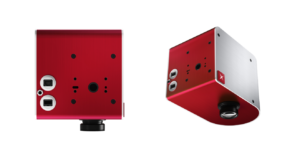 QiOVA introduced to the market the first industrial laser beam shaping module in 2014, named VULQ1, which is based on its patented Multibeam technology. 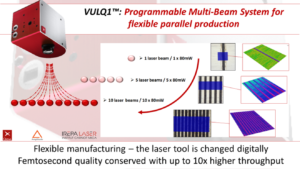 VULQ1 enables high value-added laser microprocessing solutions with minimal change to existing environment. One such usage, stamp marking, allows to mark 2D identification codes on the-fly at rate of 1000 products per second! Typical marking applications include ultra-high-speed traceability marking in pharmaceutical or food&beverage markets, anti-counterfeiting for luxury products or unique identification marking on microelectronics devices. In the realms of laser micromachining, Multibeam technology is widely recognized as a key technology to enable parallel processing in order to increase throughput by orders of magnitude. Furthermore, compared to static beam shaping device like diffractive optical elements, Multibeam technology allows to build a flexible laser machine where the laser tool can be changed digitally on-the-fly to process different products or configurations.